The Nürburgring 24 Hour race starts tonight at 11:30pm Australian Eastern Standard Time, which means the race will finish at 11:30pm on Sunday night. Yeah, around about the same time as the Monaco Grand Prix (go Daniel!). For the first time in many years I won’t be providing regular updates on the progress of the Aussie and Kiwi entrants here at AUSringers.com, but if and when I can, I hope to do so via twitter. The two most crucial links you need to know are listed below. The main stream for the race is embedded above, but if you follow the link to the official Nürburgring website listed below you can choose from a number of live streams from onboard cameras. Now that’s a pretty cool idea! Volkswagen has claimed the unofficial front-wheel drive record with its limited edition Golf GTI Clubsport S. It’s a shame this video is so dodgy, but that’s all we’ve got for now. The lap time claimed is 7 minutes 49.21 seconds, which is a bit over one second quicker than the Honda Civic Type-R. If I was being cheeky, I’d say that about as much time as could be expected to gain with the revised and resurfaced Quiddlebacher Hohe section of the track. The Clubsport S boasts a manual gearbox and 228kW/380Nm. Its rear seats have been removed, among other weight saving measures and only 400 will be built. And I’d like one please! 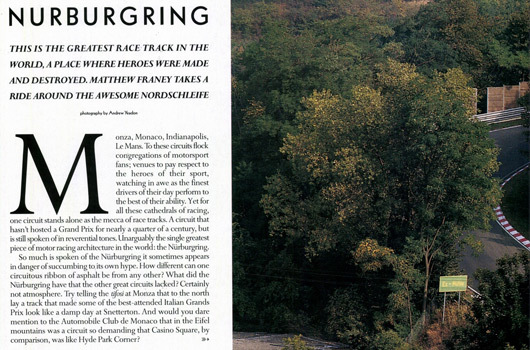 A bit over 90 years ago, 27 September 1925 to be exact, the first work on the construction of the Nürburgring began. To mark that anniversary the official Nürburgring Facebook page shared a brief and inspiring video which you can see for yourself after the break. It really is such a special place. If you haven’t been there yet, you really should start planning your trip. Huzzah, Nordschleife speed limits to be lifted! Good news for Nürburgring fans, the speed limits imposed on the Nordschleife back in June are set to be lifted. Of course, there’s a catch. The first being the limits, currently affecting all on-track activities, won’t be removed until 2016. The second being the track will undergo a series of modifications in order to increase safety standards for tourist laps, competitors and spectators. 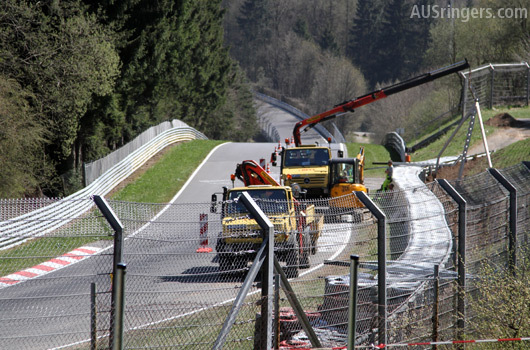 The Flugplatz section (pictured) will be resurfaced and new safety barriers and fencing will be added to the high-speed Schwedenkreuz and Döttinger Höhe sections of the Nordschleife. The modification work will commence in November and while it’s a shame to see the famed track modified it’s not the first time it’s happened and it may not be the last. Moreover, it’s said that a total of 16 measures have been listed for attention, but at this stage we’ve only been made aware of seven of those changes. What will the other nine bring? Crucially, though, the most important thing to take away from this news is that the medium-long term future of the Nordschleife looks to be assured. Serving as a reminder that I need to write my own trip report from April this year, here’s a few paragraphs from MotorSport magazine, first published in February 2000. Centred around a 12th century castle in the densely wooded village of Nurburg, the plans outlined over 17 miles of track, consisting of two loops: a 4.81-mile southern lap, the Sudschleife, and a leviathan 14.17-mile Nordschleife. 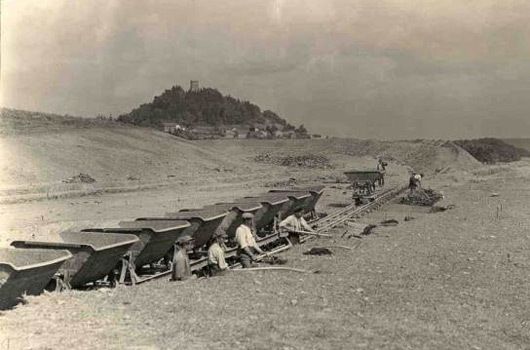 Work began in September 1925, with over 20,000 men employed on its construction. The result pitched and dived, twisted and turned through over 170 distinct corners, sometimes descending and climbing gradients as steep as 1 in 6, at others storming along engine-testing straights nearly two miles in length. At the broad start-finish area stood fifty pits; directly opposite a grandstand and luxury hotel offering spectacular views of the racing. Today, public demand to sample the circuit has led the owners to construct an incongruous space-aged toll booth half way along the famous Duttinger-Hohe straight There, when the track is not under private hire, you can part with a few deutschmarks and head out onto the track in whatever transport you happen to have pitched up in. Crazy as it may seem you will undoubtedly end up sharing your lap not just with a hoard of Barry Sheene wannabes, but the odd coach, caravan and asthmatically wheezing Trabant. Accelerating hard in Motor Sport’s BMW 328Ci, the track lures you into ever greater speed, the car admirably poised as you lean into the right-hander that signals the start of the Hatzenbach. Next is a series of S-bends, flowing and smooth. If you are like me, you will have a grin on your face. Prepare to have it wiped off… For there at the end of the Hatzenbach that familiar Niirburgring refrain: one deceptively tight corner after a series of faster ones. I jumped off the throttle just in time but I knew I had escaped lightly. And that’s the Nurburgring through and through—one long lesson in your own personal driving limits. That last line there is as true today as it has ever been. It’s a great read covering a lot of history and with some quotes from the 1930s and 50s, make sure you follow the link below to see the full article. Worth noting is the lack of graffiti on the track, too. Fifteen years ago is a long time, yes, but I would have expected to see some paint on the tarmac at that point. Especially as there was plenty of graffiti in 2006. Something to investigate further perhaps.